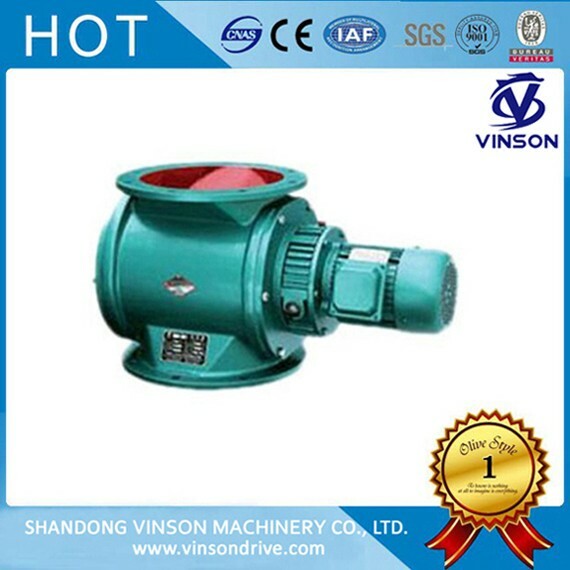 Discharge gearbox can be used in the collection of material systems, it is the most advanced discharge device since now, and commonly used in the dust removal system, it Particularly suitable for dust, small particles of materials, and is favorable by the environmental protection, metallurgy, chemical, food, cement, road construction, drying equipment and other industrial sectors. Ordinary Type: can be used in the normal temperature below 80 degrees, and the usual material, it can be continuously evenly to the feed pipe for the feed, and in the system and separation of dust collection, it can be used as unloader function. High Temperature Type: According to the material delivery and the temperature difference between the lower feed temperature because of the impact of body expansion, as well as bearing and oil seal system. High Pressure Type: it uses closed rotor, and could be widely used in suction, pressure-type air delivery system and negative pressure transmission equipment; it can ensure that the inside air pressure t not leak, which could transport and receive materials safely.